If this were all true, Shaked would have no reason to come to the defence of Zionism in the face of human rights. For Shaked and the right, the debate on human and civil rights is anti-Zionist, even antisemitic. It seeks to undermine and destroy the Jewish state. What are today’s Zionist challenges? To “Judaize” the Negev and Galilee, remove the “infiltrators,” cultivate Israel’s Jewish character and preserve its Jewish majority. The occupation, the settlements, the cult of security, the army — which is primarily an occupation army — that is Zionism circa 2017. All its components are contrary to justice. After we were told that Zionism and justice were identical twins, that no national movement is more just than Zionism, Shaked came to say: just the opposite. Zionism is not just, it contradicts justice, but we shall cleave to it and prefer it to justice, because it’s our identity, our history and our national mission. No activist for the boycott, divestment and sanctions movement would say it more sharply. But no nation has the right to spurn universal principles and invent its principles that call day night, the occupation just and discrimination equality. All this joins the calamity of the occupation – indeed, a great calamity – which is the only thing Levy sees. Without solving this disaster, everything else can and should be destroyed, as far as he’s concerned. This includes, for example, his basic right to speak his mind about Israel, or just live here without being sent to a re-education camp if he refuses to swear allegiance to Coalition Chairman David Bitan. The damage in Levy’s alliance with people like Shaked is his view that what Shaked, Tourism Minister Yariv Levin and their ilk are offering is Zionism. It’s not. It’s a sadistic distortion that interprets the justified defence of the Jews by establishing a national home as savage aggression outwardly (against the Palestinians) and inwardly (against the government’s critics). Chaim Herzog was right to rip up the UN resolution stating that Zionism was a form of racism, because Zionism was the answer to racism, to the persecution of Jews worldwide and the very real danger to their existence. Without playing down the Palestinian people’s tragedy in 1948, without excusing the Mapai party, Labour’s predecessor, for its historic mistakes, and without detracting from Likud’s role in nurturing the settlements and widening the Israeli divide, the disgraceful right wing that has grown in recent years is an entirely different matter. It isn’t a necessary evolution of Zionism or an honest demonstration of it, as Levy argues, but an expression of evil and dangerous impulses – part of a toxic global climate – that normal, decent leaders are obliged to restrain. Levy prefers the leadership of Shaked, Miki Zohar and Bezalel Smotrich to the liberal Likudniks, certainly to the abominable Mapainiks, because they tell the truth; that is, they sincerely express sentiments popular among the people. Not to make a direct comparison, but Hitler also told the truth, expressing the secret desires of many Germans and non-Germans. Nor did he have any qualms about carrying these desires out. Was he better, in the test of history, than leaders of his time who showed restraint? It’s hard to ignore the perfect tango performed by Shaked and Levy. She wants a greater Israel as part of the Jewish dominance fantasy enshrined in the Bible, and he wants a binational state as part of an exotic stroll in the fields of wild radicalism. She sees Jews as a master race with privileges and the Arabs as a thorn in our side, while he sees Jews as evil villains and Arabs as cute Tamagotchis with no historic responsibility for their predicament. “Now, then, is the time for a new division, braver and more honest, between those Israelis who agree with Shaked’s statement and those who object to it. Between supporters of Zionism and supporters of justice. Between Zionists and the just. Shaked did not provide for a third option,” Levy sums up. 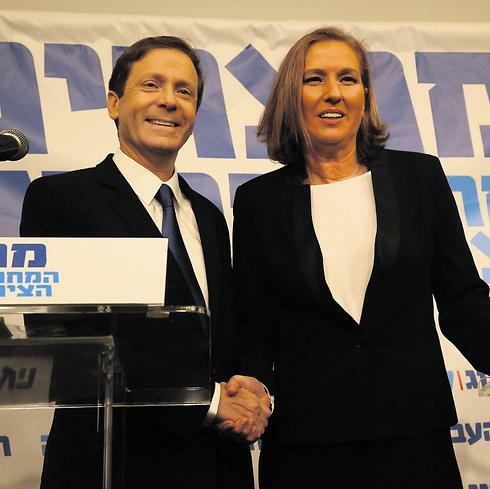 The Left’s Zionist Camp for the last election. Gideon Levy’s greatest anger is for the feeble and fearful left. That’s why I prefer Shaked. With her, what you see is what you get – racism. In its actions and deeds, the Zionist left has done everything to implement Shaked’s views, only in polished words and without acknowledgement. The Zionist left is embarrassed by things Shaked and her colleagues are not ashamed of. That doesn’t make the left any more moral or just. It has merely been quasi-Shaked in its actions. The occupation was no less cruel under left-wing Israeli governments, which was the founding father of the settlement enterprise. Those princes of peace Shimon Peres and Yitzhak Rabin established more settlements than Shaked and caused the deaths of more Arabs. The left has enthusiastically defended every military action Israel has carried out and every brutal act committed by the Israel Defence Forces. It hasn’t just sat silent in the face of such acts; it has been supportive. Always. Operations Cast Lead and Protective Edge in Gaza (in 2008-09 and 2014, respectively) involved thousands of senseless deaths, and most of the Zionist left supported them. The majority of those on the left supported the siege on Gaza, the checkpoint executions, the nighttime abductions, the administrative detentions, the abuse, dispossession and oppression – the left remained silent throughout. But the truth is that it’s not Shaked and it’s not the left. It’s Zionism. Havoc has been wreaked, as Hecht herself wrote. But instead of trying to repair the unstable foundations, all of Israel – and not only the right wing – has done everything to undermine them even further. Yes, this involves the 1948 War of Independence, which has to be discussed even though it’s uncomfortable. The spirit of 1948 has never stopped blowing here and, in this respect, Shaked and Hecht are in the same boat. According to this view, there is only one people here that needs to be considered, only one victim, and it is entitled to do as much harm as it wishes to the other people. That is the essential evolution of Zionism. It could and should have been rectified, without derogating the Jews’ right to a state. But the Zionist left has never done this. It has never acknowledged the Nakba suffered by the Palestinians, and never did anything to atone for its crimes. This never happened because the Zionist left believes in exactly what Shaked believes in. And on the truly crucial issue that overshadows all others, Shaked and Hecht are performing a perfect tango together, with a fragrance of true love exuding from them both – a Zionist tango.